Who needs a date night?! 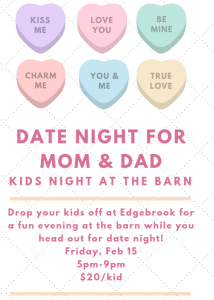 Edgebrook is having a Parents Night Out on February 15, 2019. Make those Valentine reservations now!! Click the invitation below to sign up and paypal us the $20/child to reserve your spot!